Tuck Pointing, Brick and Chimney Repair Toronto | Turnbull Masonry Ltd > Blog > Blog > Do Cracked Bricks Always Signal Foundation Issues? Do Cracked Bricks Always Signal Foundation Issues? Cracked bricks can signal worry bells regarding potential foundation issues, especially when cracks are located near the corners of your home, or follow a stair-shaped pattern. Although, cracked bricks do not always mean you have foundation issues. There are many more reasons why your brick home, wall, or other structure, may be dotted in cracks. There are certain things that make your home more prone to foundation issues. For instance, failing to maintain an optimum slope away from the foundation—thus allowing water to flow towards your home instead of away from it. Soft soil that is prone to sinking can also lead to issues in a relatively short time. Different cracks can signal more warning than others. For instance, small cracks in the mortar are almost never something serious to worry about and require simple repairs. On the other hand, a stair-step crack with visible signs of bulging is more of a concern. And, horizontal cracks tend to be even more serious. Settlement cracks: common in most homes, although the size and location of cracks signify how much settling has occurred. It’s normal to experience some settling, although, at a certain point dramatic settling can signal underlying issues. Floors that slope one way or another (especially if there are changes in slope). Doors and windows do not close or open properly. There are cracks in the drywall around the house and ceilings. At each corner of your home, look down the foundation wall to check for signs of bowing or leaning. If you notice this, it could signal that your foundation has shifted. Or, there is significant pressure on the foundation caused by expanding/contracting soil. Aside from foundation issues, there are other reasons why bricks start cracking. Moisture absorption is the leading cause of cracks in bricks. Typically, issues start off as cracks in masonry joints. If left untreated, weak and crumbling masonry puts excess pressure on surrounding bricks, while also letting moisture in at an unsustainable rate. Ultimately, this leads to the development of cracks in brickwork. The best way to prevent mortar cracks from expanding into brick cracks? 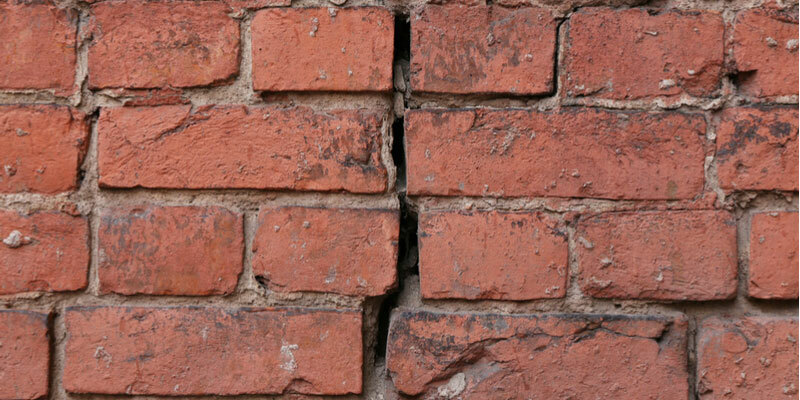 Simply have masonry joints repaired at the first sign of soft, crumbly or cracking mortar. Additionally, after a large brick wall is installed it can expand by as much as a half-inch in length simply because it absorbs moisture over time. This can create some issues for connecting joints where walls intersect. After a long wall expands, you may notice diagonal or vertical cracks in bricks near the corners. It is not uncommon for people to confuse this expansion of bricks for foundation issues. Can You Prevent Expansion & Brick Wall Cracks? There are some things you can do to help prevent brick walls from cracking. For instance, hiring an experienced mason to perform construction and repairs will always help. An experienced mason builder can offset moisture expansion by creating narrow open gaps in brick veneer at certain intervals, generally between 3/8 to ½ inch wide. From there, a specialized material called a backer rod can be installed in the gaps and caulked over to prevent water from entering. Moisture expansion generally occurs within 9 months of construction and may continue until around five to ten years post-construction. Don’t panic over cracks in your brick walls! Instead, call a qualified repair mason. At Turnbull Masonry, we are more than happy to assess the issue and determine the cause and most cost-effective solution. Call us today to learn more and schedule an appointment.